Pretty much all astronomical telescopes use mirrors, rather than lenses, to focus light. The reason is that it's easier to create a near-perfectly smooth polished surface on a mirror than it is to ensure that a lens, including its insides, is optically flawless. 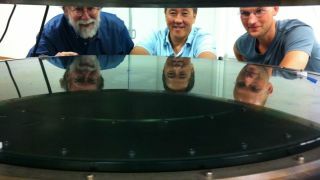 Improving telescopes, therefore, is about making the surface of those mirrors as reflective as possible. "Silver is the most reflective material, but it is finicky to work with, and it tarnishes and corrodes easily," said Andrew Phillips, an astronomer from the University of California Santa Cruz. So most telescopes out there today use aluminium in their reflective mirrors, even though it reflects less light, simply because it's easier to work with. But now, a technique invented by the electronics industry may be able to change that. In chip factories, silicon wafers are made using a technique called "atomic layer deposition", which gradually builds up a thin film of material one molecular layer at a time. The result is an incredibly uniform surface that conforms perfectly to the surface of whatever's underneath. Telescope engineers believe this technique could be used to deposit silver coatings onto mirrors. "The problem is that the systems used in the electronics industry are designed for silicon wafers, so they're too small for a telescope mirror," says Phillips. So he's scaling it up, and got a machine delivered to his lab in July that can accommodate objects almost a metre in diameter. So far the mirrors they've made use a traditional approach to lay down the silver then the atomic layer deposition process to make a barrier that protects it from tarnishing. "Right now, it's a hybrid process, but we're following the development of atomic layer deposition for the silver coating as well," Phillips said. Ultimately, it's hoped that this technology will let us see farther and more clearly into the heavens. "This is the last trick we have to make existing telescopes more efficient," said Michael Bolte, who worked with Phillips on the research. "It could really make a big difference."